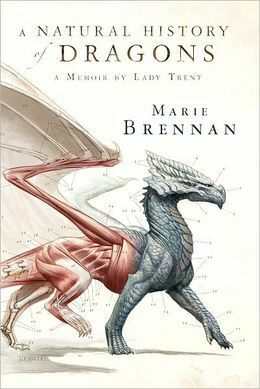 A Natural History of Dragons: A Memoir by Lady Trent is a fictionalized account of a Victorian(-esque) woman's efforts to become a scientist of note. The book's author is Marie Brennan. The book is the first in a series that relates Lady Trent's life. This book tackles the early part of her life, from her childhood spent catching sparklers and dissecting birds to her coming out and marriage, and then onto her first scientific trip to the far reaches of the world (basically an alternate Russia). Through it, her love of dragons runs deep, though I don't quite know why she loves dragons so much. I think because they are large and can fly. In this world, though, dragons are just another animal - they cannot speak (at least, not to humans). If you ever watched Discover Channel's Dragons: A Fantasy Made Real (and if you didn't, why not?! ), this is more in that tone. This is one of those books I liked on so many levels, except perhaps the deep emotional one (which is an important level). I love the premise, I love the setting, I love the feminism, I enjoy the narrative voice, and gosh, I like dragons. But while I think Lady Trent is someone that I would like to know and admire greatly, she probably isn't someone that I would make an effort to see regularly. There was just a bit of distance between us. She is not cold, I just that I did not feel a great deal of warmth for her. And none of the other characters were given much meat, either. Everyone just felt quite shallow to me, and I wanted a chance to get to know them better. That said, on an intellectual level, this book was very engaging! There is a mystery at the center of this book - why have dragons started to attack humans in a particular region when they never did before? And what helps to solve this mystery? SCIENCE. And Lady Trent is one of the people involved in figuring it out! I can only imagine how wonderful that must have felt for her, and that came through loud and clear - when you help advance knowledge about your lifelong passion, the feelings, they are good. I also appreciated Lady Trent's narrative voice. She writes these memoirs when she is much older and wiser. It's nice to see that somewhere along the way, she grew confident in her own scientific abilities and stopped apologizing for being a woman. You can see glimpses of her just OWNING IT in the future, and I am excited to read the books about how she got there. Even today, it's difficult to be a woman in science, and I think this would be a fantastic book for younger readers to see what a worthwhile struggle it can be. On a side note, I am LOVING all these books about women science geniuses. Flavia is still my absolute favorite, but I appreciate Lady Trent, too! Anyone have any other recommendations? I can't think of any other books with scientific women, but if you do find more, please let me know! I really want to to read this one, purely for the woman scientist/genius element. I think that will be enough for me to enjoy it, although I hope I have more luck engaging with the main character than you did. I have this one on the TBR stacks - because I love dragons too, and Victorian women adventurers! Btw, this does look good. I bet I would love a good dragon book. I really must get around to reading this. I read Marie Brennan for the first time last year and really liked her. I should finish that series before I start another one! Oh, you know what is a good book about a lady scientist? With the added benefit of being true? Lauren Redniss's Radioactive. It's an exceptionally lovely book about the Curies, mostly Mme. Curie, and I loved it. The illustrations are gorgeous and the book altogether made me feel extremely of the Curies. Definitely making the wish list. While I can appreciate not connecting to a character, I also appreciate still "loving" the book in so many other ways. I loved Lady Trent's character and snark, though ultimately I wish there'd been more to all the characters. Here's hoping we delve deeper in the next book. It's unfortunate you didn't connect to these characters emotionally, but it sounds like you still enjoyed this one. I've been reading to read this one for a while (and continue the Flavia DeLuce books as well..). Oh man, there are so many books to read. But if you find more books about science & women, please let me know! Because I want to add even more books to my list.